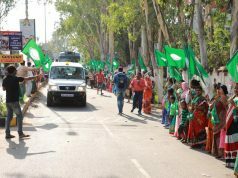 Bhubaneswar: Hundreds of tribals and Forest dwellers under the banner of Campaign for Survival and Dignity(CSD) marched in a protest Rally and protested against the State Govt. for violating Forest Rights Act in the State. 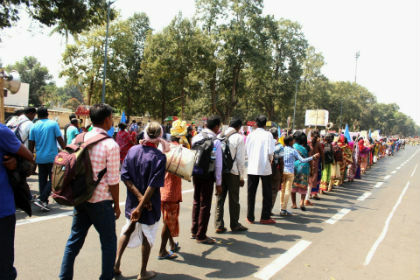 About 5000 tribals and forest dwellers march in protest rally started from Master Canteen and marched towards Lower PMG where a public meeting was organised. The protesters gave slogans i.e. “Gram Sabha Sarkar Zindabad”, “CAMPA Fund Act Radkaro” Adibasi Virodhi 28th March 2017 NTCA Order Radkaro”, Gosti Adhikar Aamar Dabi”, “Samasta Swikruti Praptya jungle Jami Chinhata Kara”, “Ana Adibasi ra Byaktigat jungle Adhikar Ku Mannyata Dia”, “Jungle Gaaon ku Rajaswa Gaaon re Parinata Kara”. Chasa Jamira brukshya ropan Banda karo,” Kendu Ptra upara Gaaon ku Malikana Adhikar Dia”, “MSP for MFP scheme Lagukara ……etc. Sharing the objective of the protest March, Gopinath Majhi, the CSD, Odisha Convenor said “the protest march is organised to protest against non-recognition of community forest rights by Govt. of Odisha in last 10 years of FRA implementation in the State and also against the Central Govt. for bringing anti FRA CFA Act, 2016.”. He said the fund accumulated from destroying forest if implemented will empowered forest Department rather forest.” Pradeep Sahoo, senior Member of the CSD, Addressing the Rally said, “ While the Govt. 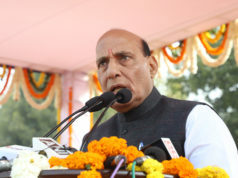 of Odisha is claiming to be No.1 State in the country, in the last 10 last years, State Government has undermined the authority of the “Gram Sabha Sarkar” and have haphazardly issued IFR titles without demarcation.” Questioning the crocodile speed in recognising Community Rights in the State he said “While around 40 thousand villages are eligible to get community rights over forest, the Govt. of Odisha reported to have just haphazardly recognized community forest rights of merely 5964 in Kandhamal(1070), Keonjhar(511) Mayurbhanja((414) Kalahandi(185), Rayagarda(178) Malkangiri(74) and Koraput(58) in the State by 31st Dec 2017 .Even many these so called CFR titles are mostly issued under Section 3(2) of FRA and not under Section 3(1)”It is to be noted that as per the FRA SLMC Report by 31st Dec 2017, 1040 IFR claims of OTFDs have been approved at the DLC levels and only 628 OTFDs have issued IFR titles including 555 in Sundargarh 15 in Angul, 11 in Rayagarda and 47 in Malkangiri districts. “If OTFDs of these districts are eligible under FRA, 2006, how OTFDs living in other districts are ineligible? questioned Duleswar Bhoi from Deogarh district. CSD had made the State bureaucrats responsible for the low recognition of IFR rights to the OTFDs in the State. Mrs. Karmi Besara of Odisha Narisamaj joining the protest Rally slam Odisha Government for deciding to stop implementation of Central Govt.’s “MSP for MFP” Scheme in the State and demanded proper implementation of MSP for MFP Scheme to provide fair price to NTFP gatherers, creation of proper storage place in terms of godawn and warehouses and to support for value addition of NTFP through appropriate collective of fetch remunerative prices. In the protest Rally CSD members also criticized the State Forest Department for forcible planation on cultivable forest land and relocating tribals from sanctuaries and condemned the National Tiger Conservation Authority (NTCA) for its circulars restricting FRA implementation in Tiger Reserves and demanded for its immediate withdrawal. . Samara Golari, President of Forest Right Committee of forest/un surveyed village Dutelguda of Malkangiri district demanded immediate identification of all forest and un-surveyed villages of the State and to convert them into revenue village. To protect the interest of the tribals living in scheduled 5th areas, CSD has urged the Govt. of Odisha to implement the Central PESA Act, 1996 in its true spirit and to reform the Panchayatiraj system with the provision of FRA Gram Sabha in all villages and has demanded Panchayat in every village. Eminent Guests Prafulla Samantara, Panchanan Kanungo, Rabi Dash, Biswapriya Knaugo, Radhakanta Sethi, Manas Jena joined and addressed the gathering. 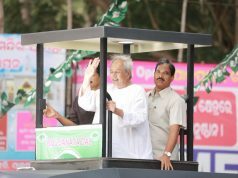 After the protest rally CSD, Odisha submitted a 18 points memorandum to the Hon’ble Governor of Odisha and have requested him to direct the State and Central Govt. to implement the FRA in its true spirit in the State.